Configure API methods to require an API key. Create or import an API key for the API in a region. Before setting up API keys, you must have created an API and deployed it to a stage. For instructions on how to create and deploy an API by using the API Gateway console, see Creating a REST API in Amazon API Gateway and Deploying a REST API in Amazon API Gateway, respectively. The following procedure describes how to configure an API method to require an API key. Sign in to the AWS Management Console and open the API Gateway console at https://console.aws.amazon.com/apigateway/. In the API Gateway main navigation pane, choose Resources. Under Resources, create a new method or choose an existing one. 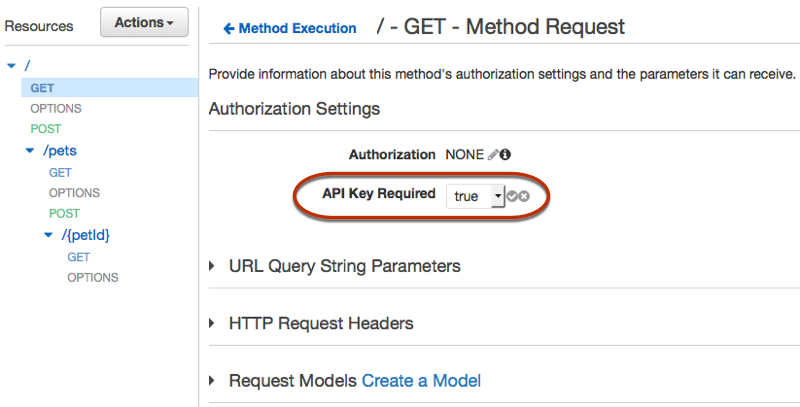 Under the Authorization Settings section, choose true for API Key Required. Select the checkmark icon to save the settings. Deploy or redeploy the API for the requirement to take effect. If the API Key Required option is set to false and you don't execute the previous steps, any API key that's associated with an API stage isn't used for the method. If you've already created or imported API keys for use with usage plans, you can skip this and the next procedure. In the API Gateway main navigation pane, choose API Keys. From the Actions drop-down menu, choose Create API key. Type an API key name (for example, MyFirstKey) in the Name input field. 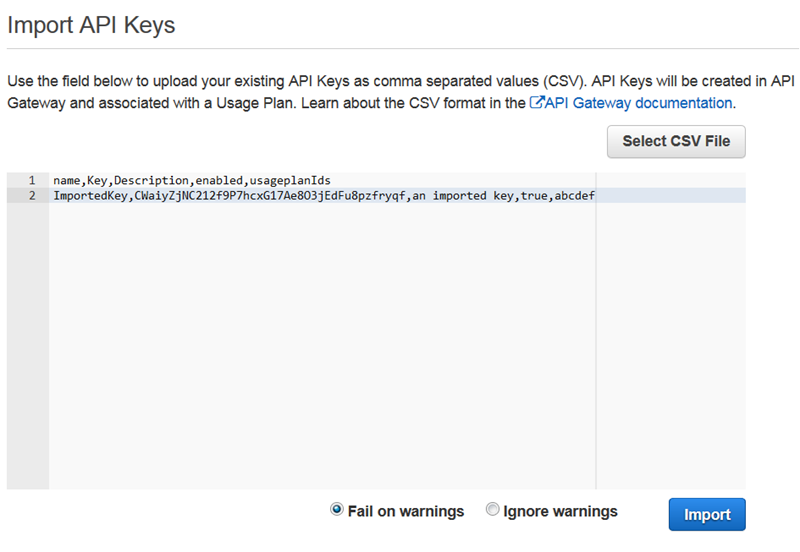 Choose Auto Generate to have API Gateway generate the key value, or choose Custom to enter the key manually. Repeat the preceding steps to create more API keys, if needed. The following procedure describes how to import API keys to use with usage plans. In the main navigation pane, choose API Keys. From the Actions drop-down menu, choose Import API keys. To load a comma-separated key file, choose Select CSV File. You can also type the keys manually. For information about the file format, see API Gateway API Key File Format. Choose Fail on warnings to stop the import when there's an error, or choose Ignore warnings to continue to import valid key entries when there's an error. To start importing the selected API keys, choose Import. Now that you've set up the API key, you can proceed to create and use a usage plan.